The full 2017 Supermint-Hagens Berman roster: Megan Alderete, Ivy Audrain, Lindsay Bayer, Jessica Cerra, Julie Kuliecza, Scotti Lechuga, Peta Mullens, Beth Ann Orton, Liza Rachetto, and Starla Teddergreen. It will consist of 12 athletes: Shara Gillow (Australia), Roxane Knetemann (Netherlands) and Eri Yonamine (Japan) arrive in the team and join Roxane Fournier , recent Sixth Doha Worldwide , Eugénie Duval, Coralie Demay, Aude Biannic and Charlotte Bravard . There will also be four U23 with Séverine Eraud, Victorie Guilman Anabelle Dreville and Gréta RICHIOUD . 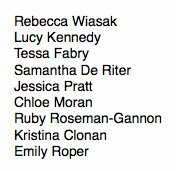 Orica-AIS for the 2017 season: Jessica Allen, Georgia Baker, Jenelle Crooks, Gracie Elvin, Katrin Garfoot, Alex Manly, Rachel Neylan, Loren Rowney, Sarah Roy, Amanda Spratt and Annemiek Van Vleuten. Canyon-SRAM’s 2017 roster: Alena Amialiusik (BLR), Hannah Barnes (GBR), Lisa Brennauer (GER), Elena Cecchini (ITA), Tiffany Cromwell (AUS), Pauline Ferrand-Prévot (FRA), Barbara Guarischi (ITA), Mieke Kröger (GER), Alexis Ryan (USA), Trixi Worrack (GER) and a Zwift Academy rider (to be announced). Lotto Soudal Ladies for 2017: Isabelle Beckers, Jessie Daams, Elise Delzenne, Annelies Dom (newcomer), Chantal Hoffmann, An-Li Kachelhoffer, Anna Kiesenhofer (newcomer), Lotte Kopecky, Puck Moonen (newcomer), Julie Roelandts, Trine Schmidt (newcomer), Kaat Van der Meulen (newcomer) and Fenna Vanhoutte.